Singapore's Minister of National Development Khaw Boon Wan has clarified that the S$880,000 five-room flats in Tampines belonged to a different class of housing options. In his latest blog entry, Mr Khaw said that the "negative reaction from the ground was not surprising", but he added that DBSS flats are of a different class of housing type between HDB flats and executive condominiums and private condominiums. He explained that DBSS flats are designed and priced by private developers. If there are no buyers, there will be no sales. A five-room HDB flat at Centrale 8 in Tampines has been put on the market for a whopping S$880,000 (around $750 psf), the priciest new public flat to be released for sale under the Design, Build and Sell Scheme (DBSS) so far. Measuring between 1,163 sq ft by 1,173 sq ft each, the 178 five-room units at the project cost nearly twice as much as standard flats sold in the recent Build-To-Order (BTO) project in Tampines, where a 1,216 sq ft flat cost up to S$444,000. Mohamed Ismail, chief executive of PropNex, said that though the flats were built by Sim Lian Group under the DBSS, the price tag is still higher than any executive condominium. He admitted that he did a double take when he first heard about the prices. "No doubt it's in Tampines, which is a mature estate with many good things going for it, but it is still extremely high for a public housing flat," he said. Despite the hefty price tag, a report from The Straits Times showed that the developer only paid S$261 psf ppr for the 21,132 sq ft site. "The premium is due to its locale in Tampines Regional Centre with mature amenities such as banks, three shopping malls and the upcoming Integrated Lifestyle Hub," said a spokesman from Sim Lian, explaining the rationale behind the high pricing. 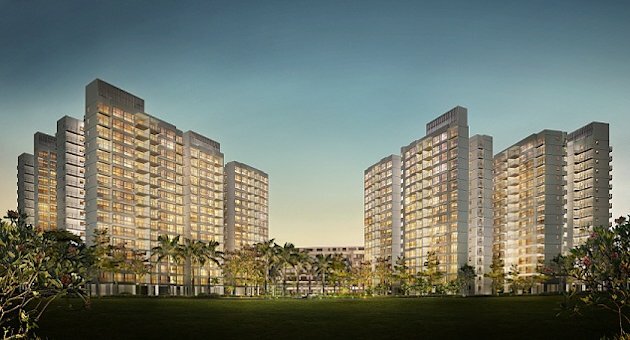 PropertyGuru analyst Tejaswi Chunduri said, "According to Sim Lian Group's indicative price range for Centrale 8, the price range for a five-room flat can be anywhere between S$685,000 and S$880,000. The floor area for these flats is in the range of 1163 to 1173 sq ft."
She added, "This will likely increase the asking price for newly developed projects as well as for the resale flats in estates island-wide." "It is also within walking distance to the existing Tampines MRT Station and the future downtown line 3 MRT interchange." However, Nicholas Mak, head of research at SLP International, said in an interview with ST that, while the location is good, it does not justify the flats' astronomical price tag. "Another side effect is that it might encourage resale flat sellers in the area to increase their prices, as buyers would not need to wait for their units to be built," he said. Prices of HDB flats have skyrocketed due to limited supply resulting from growing demand fuelled by mass-immigration. However, Khaw noted that "sharp property price increases cannot go on forever." Mr Khaw assured Singaporeans that he will be ramping up the launches of more BTOs and pricing them appropriately. 25,000 units will be launched later this year, with 12,000 already in the market. According to the Minister, larger launches may be in the works as they offer a wider range of choices.